Thomas Cardinal Wolsey, (c. March 1471-1475 – November 28 or November 29, 1530), born in Ipswich, Suffolk, England, was a powerful English statesman and a Cardinal of the Roman Catholic Church. Born in humble circumstances, he was introduced to the court of King Henry VII, who recognized his abilities and appointed him Royal Chaplain. When Henry VIII ascended the throne in 1509, Wolsey soon became his chief advisor and in 1515, Lord Chancellor. He enjoyed great influence in affairs of state and is often depicted as the alter rex (second king). Pope Leo X made him a Cardinal in 1515, and in 1518 he became the Papal Legate in England. Wolsey became involved in furthering the political ambitions of Henry VIII, maneuvering England into a position to wield power on the European continent and organizing two mass summits of the European powers, the Treaty of London in 1518 and the Field of the Cloth of Gold in 1520. By 1525, however, England’s influence had again become insignificant. Wolsey instituted a number of domestic reforms, including a “Subsidy” tax based on an individual’s income, and legal reforms which promised “justice for all,” which though not fully accomplished under his tenure, were adopted by later administrations. He also attempted reforms of the Catholic Church in England, but these were hampered by his own personal abuses of the system. Wolsey quickly fell from power when the Pope refused to annul the marriage of Catherine of Aragon to King Henry VIII. Thomas Wolsey was born sometime between 1471 and 1475, the son of Robert Wolsey of Ipswich (1438 – 1496) and his wife Joan. His father is reported by various later sources to have been a butcher but this is not certain. He attended Ipswich School and Magdalen College School before studying theology at Magdalen College, Oxford. On March 10, 1498, he was ordained a priest in Marlborough and became a personal chaplain, first to John Cardinal Morton, the Archbishop of Canterbury, and then to the governor of Calais where he met Henry VII. Wolsey's talents were recognized by important men such as Sir Richard Nanfan, who recommended Wolsey to King Henry VII. Henry VII, who distrusted the nobility and deliberately sought to favor those from more humble backgrounds for positions of prominence, appointed Wolsey Royal Chaplain. In this position, Wolsey was secretary to Bishop Fox, who recognized Wolsey's innate ability and dedication and appreciated his industry and willingness to take on tedious tasks. This brought him to the attention of the new king, after the death of Henry VII in 1509. Thomas Wolsey’s remarkable rise to power from humble origins can be attributed to his intelligence and ability at organization, his extremely industrious nature, his driving ambition for power, and the rapport he was able to achieve with the king. His rise coincided with the ascension to the throne of the new monarch Henry VIII, whose character, policies and diplomatic goals were completely different from those of his father, Henry VII. Henry VII had been a calculating and administrative financier with a very passive approach to foreign policy, fearing that a war would only deplete the national treasury. He held the nobility in low esteem, taxing much of their wealth and property and bestowing titles very infrequently. As a result of this approach, he bequeathed his son a stable economy. Henry VIII was actively interested in foreign policy, and had few scruples about involving his country in expensive wars; he hoped to gain the French crown by uniting the nobility behind him in an invasion of France. Another factor in Wolsey's rise was that Henry VIII was not particularly interested in the details of government. As a boy, Henry VIII had not expected to become king, and had received little training in politics or government prior to ascending to the throne. Acknowledging his own inexperience in the field of economy and domestic affairs, he was content to allow someone like Wolsey to handle the fundamental details for him. Wolsey also pleased Henry because their personalities were similar; both were extroverted and ostentatious, inclined to lavish displays of wealth and power. In 1509, Henry VIII appointed Wolsey to the post of Almoner, a position that gave him a seat on the council, and an opportunity to raise his profile and to establish a rapport with Henry. Wolsey earned Henry's trust through his integrity and his ability to accomplish whatever he was asked to do. He volunteered for the tasks shunned by others, and was always willing to overstep the boundaries of his job as almoner, dabbling in both domestic and foreign policy and making a good impression on the king’s counselors and the king himself. From his father, Henry VIII inherited two cautious and conservative primary counselors, Bishop Fox and William Warham, Archbishop of Canterbury, who advised him to be a careful administrator. Henry soon began filling his council with individuals more sympathetic to his views and inclinations. Until 1511, Wolsey had been adamantly against the war, but when the king expressed his enthusiasm for an invasion of France, he dropped his moral and economic reservations, and exploited the opportunity. He pragmatically changed his views, even giving persuasive speeches to the council in favor of war. Warham and Fox, who failed to share the king’s enthusiasm for the French war, fell from power and Wolsey stepped into their shoes. In 1515, under mounting pressure instigated by Wolsey, Warham resigned as Lord Chancellor, and Henry appointed Wolsey to replace him. Wolsey quickly asserted himself, ignoring those members of the council who held grudges against him. He won a powerful ally in Charles Brandon, Duke of Suffolk, by defending him when he displeased the king by secretly marrying Henry’s sister Mary (the now-widowed queen of France). Wolsey's rise to secular power was accompanied by increased responsibilities in the Church. He became Canon of Windsor, Berkshire in 1511, the same year in which he became a member of the Privy Council. In 1514, he was made Bishop of Lincoln, and then Archbishop of York. Pope Leo X made him a cardinal in 1515, with the Titulus S. Caecilae. As tribute to the success of his campaign in France and subsequent peace negotiations, Wolsey was further rewarded by the church: in 1523 he was made Prince-Bishop of Durham. A complex network of constantly changing alliances and ruthless power struggles dominated sixteenth-century Europe. Despite their inexperience, Henry VIII and Wolsey succeeded in making England a desirable ally, sought after by the two great powers of France and Spain. A convenient justification for going to war came in 1511, when Pope Julius II, who was beginning to feel threatened by France, asked for help. England formed an alliance with Ferdinand II of Aragon, and Maximilian I, Holy Roman Emperor. The first campaign against France was unsuccessful, partly due to the unreliability of the alliance with Ferdinand. Wolsey learned from the mistakes of the campaign, and in 1513, still with papal support, launched a joint attack on France, successfully capturing two French cities and causing the French to retreat. Wolsey's ability to keep a large number of troops supplied and equipped for the duration of the war was a major factor in its success. Wolsey also had a key role in negotiating the treaty of 1514, which secured a temporary peace between France and England. Under this treaty, the French king, Louis XII was to marry Henry’s young sister, Mary. In addition, England was allowed to keep the captured city of Tournai and to secure an increase in the annual pension paid by France. With Henry’s sister Mary Tudor married to the French King, Louis XII, a lasting alliance seemed assured. Only a year later, however, Louis died and was replaced by the young, ambitious Francis I, who had no intention of continuing an alliance with England and who became a significant rival to Henry VIII. Mary had secured a promise from Henry that if Louis died, she could marry whomever she pleased. On Louis' death, she married the Duke of Suffolk, preventing another marriage alliance. Anxiously, Wolsey proposed an alliance with Spain and the Holy Roman Empire against France. The death of King Ferdinand of Spain, England’s closest ally and Henry's father-in-law, was a further blow. He was replaced by Charles V, who immediately proposed peace with France. On the death of the Holy Roman Emperor Maximilian in 1519, Charles was elected in his stead, limiting English power on the continent. Wolsey, however, sought another means for asserting English influence. In 1517, Pope Leo X sought peace in Europe in order to form a crusade against Turkey. In 1518, Wolsey was made Papal Legate in England, and organized a massive peace summit involving twenty nations which placed England at the forefront of European diplomacy and resulted in the Treaty of London (1518). An Anglo-French treaty was signed two days afterwards. Ironically, this peace treaty contributed to desired conflict between France and Spain. In 1519, when Charles ascended to the throne of the Holy Roman Emperor, Francis, king of France, who had invested enormous sums in bribing the electorate to select him as emperor, was infuriated. He used the Treaty of London as a justification for the Habsburg-Valois conflict, and Wolsey acted as an apparent mediator between the two powers, both of whom were vying for England’s support. Another of Wolsey’s diplomatic triumphs was the Field of the Cloth of Gold (1520). He assiduously organized every detail of a grandiose meeting between the French king, Francis, and Henry VIII, accompanied by some 5,000 followers. Though it seemed to open the door for peaceful negotiations with France, it was also a chance for a lavish display of English wealth and power before the rest of Europe. With both France and Spain vying for England’s allegiance, Wolsey could choose the ally which best suited his policies. Wolsey chose Charles, mainly because England's economy would suffer from the loss of the lucrative cloth trade industry between England and the Netherlands. The Treaty of London (1518) is often regarded as Wolsey’s finest moment, but its half-hearted aspirations for peace were abandoned within a year. Wolsey ensured the failure of the treaty by allying with Charles in 1520 in the conflict against France, and ignoring the Anglo-French treaty of 1520. Wolsey's relationship with Rome was also ambivalent. Despite his loyalties to the papacy, Wolsey was strictly Henry’s servant. Though the Treaty of London was an elaboration on the pope’s ambitions for European peace, it was seen in Rome as a vain attempt by England to assert her influence over Europe. Furthermore, Wolsey’s peace initiatives prevented the crusade in Turkey, which had been the pope’s main objective in seeking European peace. Lorenzo Cardinal Campeggio, sent to represent the pope at the Treaty of London, was kept waiting for many months in Calais before being allowed to cross the Channel and join the summit in London. By inhibiting the Cardinal’s travel to London, Wolsey was asserting his independence of Rome. In 1529, Campeggio was still a Cardinal in Rome and had become even more influential. His resentment of the treatment he had received in Calais was instrumental in the Pope’s refusal to annul Henry VIII’s marriage to Catherine of Aragon, Wolsey's most significant failure. During the 1522-1523 wars, Henry’s ambitions resulted in an invasion that was not as well organized as the 1513-1514 invasion had been. England was depending on the possibility of a disgraced French noble, Charles III, Duke of Bourbon, leading a revolt that would distract the French from the English invasion in August 1523. The revolt failed. Charles V, who had promised to come to England’s aid, did not, due to a lack of funds. The situation was further exacerbated by bad weather, which proved critical in the English defeat. To cover the expenses of this costly disaster, the Parliament of England had to raise additional taxes. Parliament continued to interfere with Wolsey’s overseas ambitions. After the disastrous campaigns of 1522-1523, with England’s losses in Europe outweighing her gains, distrust and criticism of Wolsey increased. Though England did not gain any benefit from the wars of 1522-1523 was minimal, her contribution aided Charles in defeating the French. In 1525, when Charles won a decisive battle at Pavia and captured the French king, a realistic opportunity arose for Henry to seize the power of the French crown. Parliament, however, refused to raise taxes. Wolsey then devised a benevolence tax, the Amicable Grant, which was met with even more hostility and a taxpayer strike. Wolsey was obliged to abandon the Amicable Grant, and because he was unable to find the money to finance an invasion of France, Henry lost confidence in him. Charles V tired of his fruitless alliance with England and the “Great Enterprise” crumbled. After his success at Pavia, Charles had no further need for England as an ally and quickly discarded her. By 1525, England was just as isolated as she had been in 1515. Wolsey’s lack of a clear objective in his foreign policy is evident in his switching of allegiances between France and Charles. He also underestimated the devastating effects of making an enemy of the Holy Roman Empire. Although there was no actual war between England and Charles V, the wool trade suffered heavily. England’s principal customers were either from the provinces of Charles’ empire or those surrounded by his territory. When Charles ceased trade with England, there was a huge reduction in income from the wool trade, and tax revenue declined, affecting the entire nation. In 1526, Wolsey played a part in the formulation of the League of Cognac, with papal support. Wolsey’s plan was that the League of Cognac, composed of an alliance between France and some Italian states, would challenge Charles’ League of Cambrai and rescue Pope Clement VII, who had been held captive by Charles since the Sack of Rome (1527) . This initiative was not merely a gesture of allegiance to Rome, but fostered Henry’s desire for an annulment from Catherine of Aragon, a desire that was beginning to dominate foreign policy. In 1529, France bypassed Wolsey and made peace with Charles, ending Wolsey’s ambitions for the League of Cognac. Meanwhile, the French continued to honor the "Auld Alliance" with Scotland, continuing to stir up hostility much closer to England. With peace between France and Charles, there was no one to free the pope from Charles’ supremacy, and he would be unable to grant Henry an annulment from Charles’ aunt, Catherine. Since 1527, Wolsey’s foreign policy had been dominated by his attempts to secure an annulment for his master, and, by 1529, he had failed. Despite his many enemies, Cardinal Wolsey held Henry VIII's confidence until Henry decided to seek an annulment of his marriage to Catherine of Aragon so that he could marry Anne Boleyn. Henry's marriage to Catherine had produced no sons who survived childhood, leading to the possibility of a power struggle after his death. (The Wars of the Roses were still within living memory.) His daughter, Mary, was considered unable to hold the country together and continue the Tudor dynasty. Henry VIII became convinced that Catherine's inability to have a male heir was due to her having been previously married to his elder brother, marrying the widow of Arthur, Prince of Wales. Arthur was his elder brother, causing Henry to think the marriage was incestuous. Henry further believed that the dispensation for his marriage to Catherine from the Pope was invalid, because it was based on the presumption that Catherine was still a virgin on her first husband's death. Henry claimed this was not true, and thus, the papal permission and the ensuing marriage were invalid. Catherine insisted that she had been a virgin when she married King Henry. Because Queen Catherine was opposed to the annulment and a return to her previous status as Dowager Princess of Wales, the annulment request became a matter for international diplomacy, with Catherine's nephew, the Holy Roman Emperor Charles V, threatening the Pope if his aunt's marriage to Henry was annulled. Pope Clement VII was presented with a choice between angering Charles or angering Henry, and delayed his decision as long as possible. This delay angered the king and Anne Boleyn, who made Wolsey their scapegoat. Wolsey's fall was sudden and complete. He was stripped of his government office and property, including his magnificently expanded residence of York Place, which Henry selected to replace the Palace of Westminster as his own main London residence. 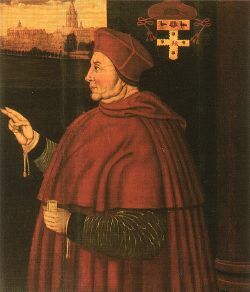 Wolsey was permitted to remain Archbishop of York. He traveled to Yorkshire for the first time in his career, and at Cawood in North Yorkshire, he was accused of treason and ordered to London by the Earl of Northumberland. In great distress, he set out for the capital with his personal chaplain Edmund Bonner. Wolsey fell ill and died on the way, at Leicester on November 29, around the age of 55. "If I had served my God," the cardinal said remorsefully, "as diligently as I did my king, He would not have given me over in my grey hairs." In keeping with his practice of erecting magnificent buildings, Wolsey had designed a grand tomb for himself, but he lost it, just as he had lost Hampton Court. Wolsey was buried in Leicester Abbey (now Abbey Park) without a monument. Henry VIII considered using the impressive black sarcophagus for himself, but Lord Nelson now lies in it, in the crypt of St. Paul's Cathedral. During his fourteen years of chancellorship, Cardinal Wolsey held more power than any other man in English history, excepting monarchs. As long as he was in the king’s favor, Wolsey had the freedom to reform England as he saw fit, and had his hand in nearly every aspect of its ruling. For much of the time, Henry VIII had complete confidence in him, and, being more involved with foreign policy, was willing to give Wolsey a free hand in reforming the management of domestic affairs. Ostensibly, Wolsey’s reforms involved carrying out the king’s wishes and enforcing his principle, as a man of the church, of fair justice for all. His success was limited by his own shortcomings and by the actions of those who resented Wolsey’s influence over the king. A good example of Wolsey’s combining of obligations to the king with a sense of moral duty is the ‘Subsidy’, which he devised with the treasurer of the Chamber, John Heron. This revolutionary form of taxation was based upon accurate valuations of the taxpayer’s wealth, where one shilling was taken per pound from the income of the taxpayer. This tax, the foundation of today’s income tax, replaced the fixed tax of fifteenths and tenths which required those who earned very little money to pay almost as much in taxes as the wealthy. The new tax was more equitable to the poorer members of society, and enabled Wolsey to raise enough money for the king’s foreign expeditions, bringing in over £300,000. Wolsey was also able to raise considerable amounts of capital through other means, such as through ‘benevolences’, enforced donations from the nobility, which, in 1522, raised £200,000. As a legal administrator, Wolsey was concerned with making justice available to all, and thwarting attempts to pervert justice. He reinvented the equity court, where the verdict was decided by the judge on the principle of "fairness." As an alternative to the Common Law courts, Wolsey reestablished the position of the prerogative courts of the Star Chamber and the Court of Chancery, which he was able to monopolize. The system in both courts concentrated on simple, inexpensive cases, and promised impartial justice. Wolsey also established a Court of Requests for the poor, where no fees were required. Wolsey’s legal reforms were popular, and overflow courts were required to attend to all the cases. Many powerful individuals who had felt themselves invincible under the law were convicted. For example, in 1515, the Earl of Northumberland was sent to Fleet Prison and in 1516 Lord Abergavenny was accused of illegal retaining. Wolsey also used his courts to tackle national controversies, such as the pressing issue of enclosures. The countryside had been thrown into discord over the entrepreneurial actions of landlords in enclosing areas of land and converting from arable farming to pastoral farming, which required fewer workers. Enclosures were seen as directly linked to rural unemployment and depopulation, vagrancy, food shortages and, accordingly, inflation. The Tudors valued stability, and this mass urban migration represented a serious crisis. Wolsey conducted national enquires in 1517, 1518, and 1527 into the presence of enclosures. In the course of his administration he used the court of Chancery to prosecute 264 landowners, including peers, bishops, knights, religious heads, and Oxford colleges. Most people in Tudor England, like Wolsey, failed to understand that population growth, and not enclosure, was the real cause of inflation. When the demand for food increased and the supply did not, prices rose and landowners reacted by enclosing land and converting to pastoral farming, which brought in more profit. Wolsey’s attempt to end enclosure was fruitless in terms of restoring the stability of the economy. Wolsey used the Star Chamber to enforce his 1518 policy of “Just Price,” which attempted to regulate the price of meat in London and other major cities. Those who were found to be charging excessive amounts were prosecuted by the Chamber. After the bad harvest of 1527, Wolsey took the initiative of buying up surplus grain and selling it off cheaply to the needy. This act of generosity greatly eased disorder and became common practice after a disappointing harvest. A common trend throughout Wolsey’s ventures was the inability to completely realize his reforms and make a lasting impact, perhaps because of the enormous personal responsibility he carried. Wolsey’s principal preoccupation throughout his 14 years as Lord Chancellor was maintaining power by reducing the influence of others over the king and refusing to delegate lesser responsibilities to others. This strategy led him to become overwhelmed with the day-to-day problems of running a country. Despite his talent for administration and organization, there were many instances in which Wolsey simply overreached himself. Wolsey’s power relied solely on maintaining good relations with Henry. He grew increasingly suspicious of the minions (king’s favorites), particularly after infiltrating one of his own men into the group, and attempted many times to dispel them from court, giving them jobs which took them to Europe and far from the king. After the failure of the Amicable Grant, the minions began to undermine him once again. Consequently Wolsey devised a grand plan of administrative reforms, incorporating the infamous Eltham Ordinances of 1526, which reduced the members of the Privy from 12 to 6, and removed troublemakers such as William Compton. As soon as Wolsey’s influence had been secured, however, he dropped the plan of reforms. This pattern was repeated with many of Wolsey’s other initiatives, particularly his quest to abolish enclosure. Despite spending a significant time and effort in investigating the state of the countryside and prosecuting numerous offenders, Wolsey freely surrendered his policy during the parliament of 1523, in order to ensure that Parliament would pass his proposed taxes for Henry’s war in France. Enclosures continued to be a problem for many years to follow. One of Wolsey’s greatest impediments was his lack of popularity amongst the nobles at court and in parliament. Their hatred stemmed partly from Wolsey’s excessive demands for money in the form of the Subsidy or through Benevolences. They resented the Act of Resumption (1515), by which many nobles were forced to return lands which the king had given to them as a gift, and many nobles personally resented the way in which he had risen to power. Others simply disliked the way in which he monopolized the court and concealed information from the council. By 1525, when he attempted to impose the Amicable Grant, he encountered unanimous hostility and rejection. When mass riots broke out in East Anglia, under the supervision of Wolsey’s sworn enemies, the Dukes of Norfolk and Suffolk, Henry was quick to denounce the grant, and began to lose faith in his chief minister. Wolsey’s legal reforms also ran aground when the new courts became overloaded with incoherent, tenuous cases, which would have been far too expensive to have rambled on in the Common Law courts. Wolsey ultimately gave up on delivering justice for all, and, in 1528, ordered all minor cases out of the Star Chamber. This provoked further resentment from the nobles and gentry, who had suffered at the impartial hand of Wolsey, and also the lawyers, who regarded Wolsey as a threat their business. The most common criticism of Wolsey’s domestic policy is that, considering the power and influence he wielded, he actually achieved very little. Wolsey was the last of a generation of medieval administrators. His reformation of the legal system and introduction of the subsidy were revolutionary initiatives at the time, and both were adopted by later administrations. Wolsey took his position as papal legate for the church in England seriously, and made marginal efforts to improve the reputation of the church. Throughout the anti-clerical mood of the parliament of 1515, he defended the church to the end, and refused to permit the re-signing of the law which diminished the “Benefit of the Clergy,” in the wake of the murder of Richard Hunne by his clergymen jailers. Wolsey was forced to kneel before the king and assure him that the “Benefit” would be no threat to his authority. Wolsey also took some steps to reform the ongoing corruption in the Catholic Church. In 1524 and 1527, Wolsey used his powers as papal legate to dissolve 30 decayed monasteries where corruption had run rife, including abbeys in Oxford and Ipswich. He used the income to found a grammar school in Ipswich and Cardinal’s College in Oxford, thus giving something back to the communities which had nurtured him. The college in Oxford was originally named Cardinal College, but was renamed King's College after his fall. Today it is known as Christ Church. In 1528, he began to limit the benefit of clergy, and, in the same year, stood up to Henry by disapproving of his choice of a woman of dubious virtue for the position of Abbess of Wilton. Wolsey had an honest concern for the reputation of the Church, but did not pursue his reforms to their completion. As Cardinal, with a lifetime legateship from 1524, Wolsey was continually vying for control over the church. His principal rival was Wareham, the Archbishop of Canterbury. Despite making promises to reform the bishoprics of England and Ireland, and, in 1519, encouraging monasteries to embark on a program of reform, he did nothing to bring about these changes. Moreover, he refused to promote others to instigate the reforms, for fear of losing his personal influence. Many historians consider Wolsey’s handling of the church as his greatest failure. Wolsey is often seen as a hypocrite, condemning the debauchery of corrupt clergymen, yet himself partaking in the crimes of pluralism, absenteeism (he was archbishop of York, yet never visited the city until 1529), simony (even when appointed, bishops and abbots could not take up their posts unless they had been “confirmed” by Wolsey, at a price), ostentatious display of wealth, sexual relations, nepotism, and the ordination of minors (the latter three illustrated through the premature rise to power of his own illegitimate son). Wolsey's tresspasses made it easier for reformists to condemn the Church and win the public over to the Lutheran ideology. Wolsey was criticized, particularly by his successor Thomas More, for failing to stamp out the threat of Lutheran heresy during the 1520s. Wolsey’s dictatorial control over the bishops left a vacuum when he was removed from power, and further weakened the Catholic Church. Wolsey had children with his mistress, Joan Larke (born circa 1490) of Yarmouth, Norfolk, including a son, Thomas Wynter Wolsey (born circa 1528) and a daughter, Dorothy (born circa 1530), both of whom lived to adulthood. Thomas married and had children; it is not known what happened to Dorothy. Cavendish, George, and Richard Standish Sylvester. 1959. The life and death of Cardinal Wolsey. London: Published for the Early English Text Society by the Oxford University Press. Ferguson, Charles W. 1958. Naked to mine enemies; the life of Cardinal Wolsey. Boston: Little, Brown. History of "Thomas Cardinal Wolsey"
This page was last modified on 3 December 2015, at 23:48.